In what year was the first cherry tree planted on the National Mall? Who came up with the idea for cherry blossoms along the Potomac? The original cherry trees were gifted to the U.S. from what country? Where were the first cherry blossom trees planted? Cherry Blossoms on the National Mall. Why did agents from the Department of Agriculture reject the first shipment of cherry trees? The ground was too frozen to plant them. They were infested with nematodes. Who in official Washington serves as “Honorary Chair” of the Cherry Blossom Festival? In what year did the first official Cherry Blossom Festival take place? Which first lady planted the first cherry tree in Washington, D.C.? 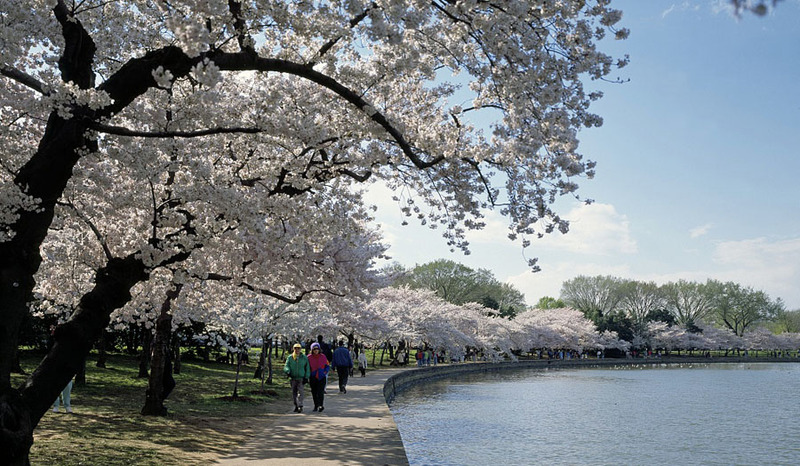 Washington D.C. has more cherry trees than any other city in the United States. In 1915, the U.S. Government reciprocated with what gift to the cherry tree donor country? Which of the following events is not part of the annual Cherry Blossom Festival? In what year did the Cherry Blossom Princesses' event start? Where does the National Cherry Blossom Festival Parade take place? How is the Cherry Blossom Queen chosen? For approximately how long does a typical cherry blossom remain in bloom? Approximately how many cherry trees are on the National Mall? What shocking event happened on December 11, 1941? Four cherry trees were mysteriously cut down. Four trees died from the cold. The U.S. Government shrouded the cherry trees in black. A beaver toppled four cherry trees.